Do you sometimes feels stumped about what to get for the grandparents? Send Grandma and Grandpa a GrandBox. The perfect gift for the holidays or just to show them how much they are loved! GrandBox is the subscription box curated specifically for Seniors and Grandparents. Each box can be personalized with family photos and a note. It's the perfect gift to bring a smile to your loved ones. I received a Grandbox to review and found the contents to be useful and entertaining. One of my favorite items in the box was a Giant crossword puzzle book. My husband loved it too because he loves doing crosswords and doesn't have to use his readers to see the words! 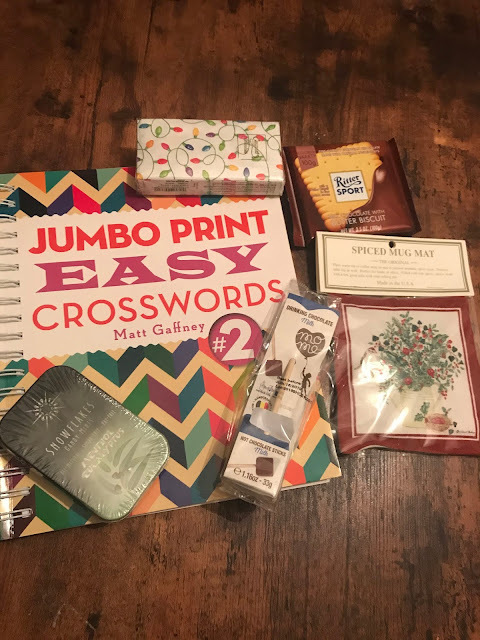 Other items included a yummy hot cocoa melt, a spiced mat for my coffee cup, some delicious chocolate, mints, and a pack of festive tissues which are great for this time of year. Nothing will be wasted in this box! 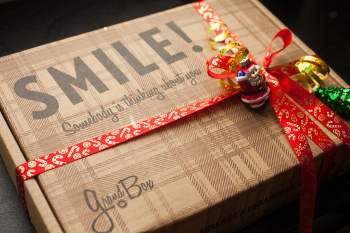 GrandBox is the perfect gift for seniors and grandparents for the Holidays, especially Valentine's day! Disclosure: I received a Grandbox as a member of US Family Guide to review for my honest personal opinion.